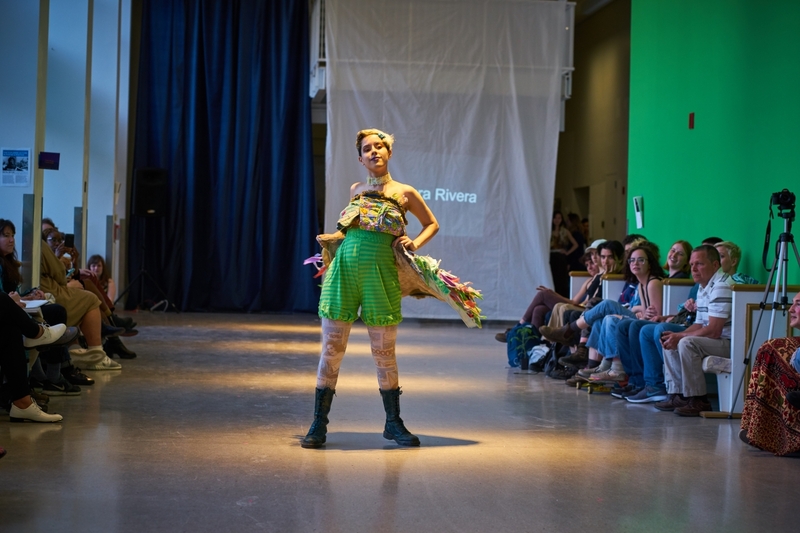 Don’t call it a fashion show­—this annual, high-energy, end-of-academic-year event at Temple University’s Tyler School of Art breaks down barriers separating artistic disciplines. Hundreds of students, faculty, staff, alumni, friends and parents gathered at the Tyler School of Art for the annual Wearable Art Show, a student-run event organized by Tyler’s Fibers and Materials Studies program that has rapidly grown into the school’s signature, high-energy closing statement of the spring semester. This year’s Wearable Art Show, called “Vestments,” brought the work of 27 student designers to Tyler’s enormous green hallway, which became a runway for the evening of April 26. The event was organized by students in adjunct faculty member Paige Fetchen’s Experimental Costume class and adjunct faculty member Timothy Belknap’s Body Art and Adornment class. They solicited entries from students all over the school, from sculpture majors to glass majors. The final designs—as many as a half dozen from each participating student artist—were showcased by student models in front of a rapt audience (and a DJ’s thunderous beats).